Last month I shared three posts for building an easy and functional wardrobe full of basics. I've heard from so many of you that those lists really helped you find holes in your closet and getting dressed got easier! As I've been getting dressed this last month, I've had several thoughts about what fun and trendy items really take a basic outfit to a new level of cool. This post is a roundup of ten more ideas for fun and trendy items to add to your basics to create outfits that are a little more edgy, quirky or interesting! 1. Overalls - Overalls are a great trendy pant style to mix in and add an element of fun to your wardrobe. I wrote a post earlier this week here with lots of styling tips for overalls and what to pair them with. I love them with a basic top and sneakers or a blouse and heels for two very different looks out of one wardrobe item. 2. Graphic Sweatshirt - This is a must for Fall! I live in sweatshirts and a good graphic adds a little bit of edge to a great basic. This lion one has been my go-to lately, but I also love sweatshirts with simple words or statements. Pair them with basic black or blue jeans, or with plaid pants for an unexpected twist. 3. Plaid Pants - Plaid is huge this year, especially small patterned, business-y type plaid. I love it everywhere, but especially in pants. The pattern adds a little bit of interest to an outfit and works for the office or for everyday depending on how you style them. Pair them with a graphic sweatshirt or a blouse! 4. Statement Earrings - I'm always going to suggest big earrings but picking some with a cool pattern or texture adds even more interest to an outfit. Camo and Leopard are my go-tos'! 5. Pleated Skirt - I've been a pleated skirt fan for years. Some of my favorites are one's that I've found at thrift stores and I still love to check for vintage ones anytime I step into one. 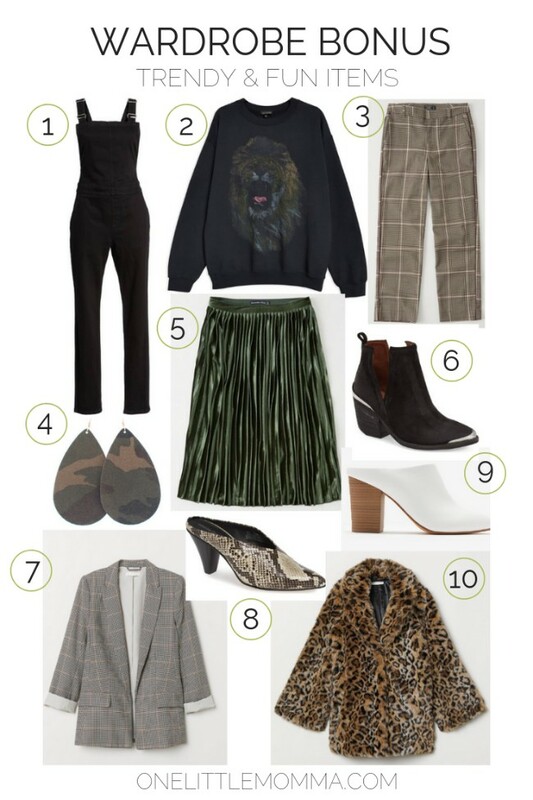 This season I'm loving green ones and especially velvet ones! Pair them with a basic tee to make them more casual or a white blouse to dress it up! 6. Western Boot - The Western trend is one that I'm fully embracing, but in a smart way. I only wear one or two Western inspired pieces at a time and a Western boot is a great way to do that. I love that there are so many options this year that have a nod to a Western look. 7. Blazer - Blazers are making a big comeback right now, but I get that they don't seem super practical if you are typically at the park or a play date. They are easier to wear than you think! Wear it like a jacket and pair it with all kinds of things. It works well with a graphic tee and jeans or a slim fitting work pant and heels! 8. Mule - Mules are also making a comeback and it has taken me some time to get on board with them. I think my favorite styles have a bit of a heel or a pointy toe flat. 9. White Boot - I've been waiting for white boots to come back for years and I've actually been wearing an off-white pair for a while now. I love the edge they add to an outfit. 10. Fur Coat/Jacket - If I collect anything, it might be faux fur. I have so many faux fur jackets in so many colors. I love that they add so much cool texture to an outfit and they are actually really warm too! I hope these fun and trendy items give you a few new ideas for your wardrobe. Just by adding a few of these pieces you can instantly add a little edge or fun to so many outfits.